I have a few photos for this. The first is of a youth jumping from a pier into the Black Sea at Qobuleti. The photo freezes him at the peak of his trajectory. The second picture is also at Qobuleti, where paragliding is popular. The third picture is on self timer, a picture of me trying to juggle four balls, a feat which soon succumbs to the pull of gravity. The final photo is of some red balloons floating in a blue sky, an image that recalls a Miro painting. 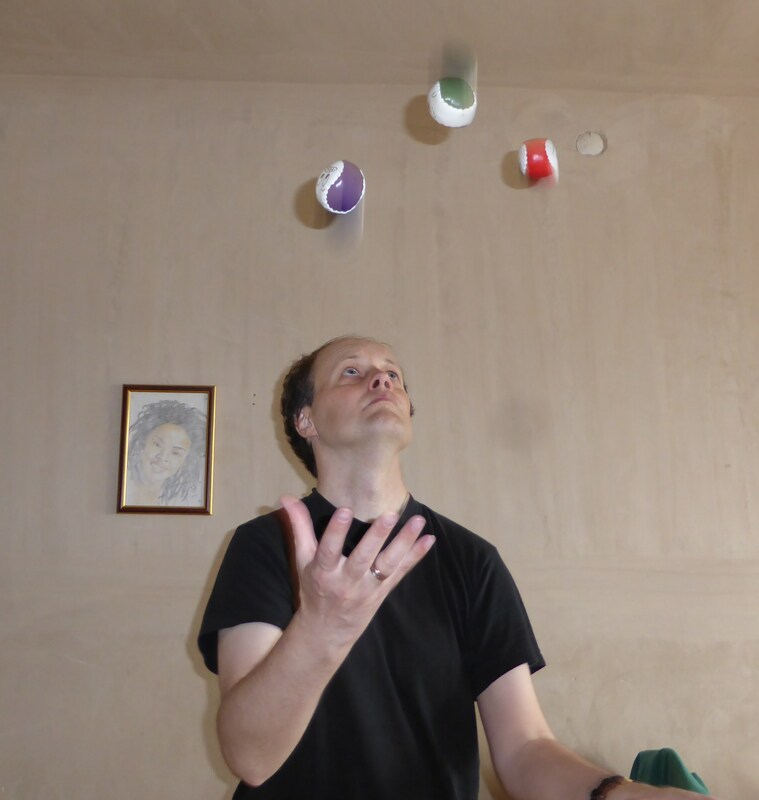 This picture is me juggling, juggling three balls was an achievement, now I’m attempting to achieve further and juggle with four. Behind me is a drawing I made of singer Lauryn Hill in 2001, possibly my greatest graphic achievement. On my finger a wedding ring, after two failed marriages, I have finally found a wonderful woman with whom I wish to spend the rest of my life, five years into marriage we have yet to have an argument, which is no small achievement. Getting the photo of me juggling was also an achievement, putting the camera on self timer and hoping to get a suitable shot (many failed). A year of blogging is also a small achievement (this my 278th post on this blog), I will never get an Olympic Medal or a Nobel Prize but small achievements are heartening.